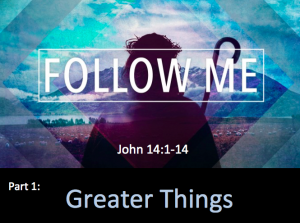 This Sunday, we will an new series called Follow Me. Over the next several weeks we will look at Jesus and how he lived his life. If we are, indeed, called to follow Jesus (and we are), we need to see what he did and how he did it. That is pretty incredible. And yet, how often do we feel like we are experiencing these “greater things”? If you’re like me, you’d like to discover what Jesus means with these words– and if it is really possible. To prepare, read John 14:1-14 and come ready to have you view of your life and ministry expanded!